Intern commitment will be 40-45 hours per week, including time on weekends and holidays. Interns are required to have a valid driver’s license and social security number. Selection criteria includes education, experience, references, and written statements. Unfortunately, at this time, the Center is unable to accept international applicants. For a complete job description listing principal duties and responsibilities as well as required knowledge, skills and abilities download our academic year intern job description, or our summer intern job description. *Start and end dates are flexible within a week or so, depending on the needs of the intern. Qualified interns with demonstrated skills may be eligible for extended or full school-year internships. The goal of this program is to give interns a strong background in wolf information and experience in conveying this information to the public. 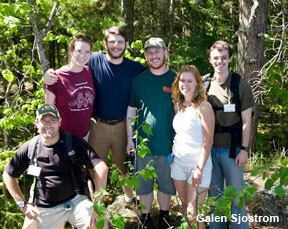 Interns conduct a variety of indoor and outdoor wolf and wolf-related education programs. Programs may have as few as two or as many as 200 participants and vary in length from 30 minutes to three hours. Summer interns work largely with the general public. Academic year interns will have the opportunity to work with visiting school and scout groups, bus tour groups, family weekends and adult programs. Interns will also contribute to the programming of the Center through special projects and support work. Projects are selected based on the talents and interests of the intern, as well as the current needs of the Center. Other areas of training include program development, scheduling of visiting groups, exhibit cleaning and curation, and possibly time spent in the retail, office and information departments. The International Wolf Center provides off-site housing for summer interns and a $500 per month stipend. The academic year position does not include housing and is provided a $1,000 per month stipend. All interns will be responsible for providing their own food and transportation between the International Wolf Center and the off-site intern housing. Interns may need to share living quarters with other interns. Or email Krista Harrington at krista@wolf.org.